Brian and Katie Ernst are a full time, touring music and non-profit duo, originally from Ohio (USA). When they met in summer of 2006, Brian was working a 9-5 job through the week, street performing on the weekends and Katie was finishing up university. They both volunteered in New Orleans (post Katrina) and had dreams to be able to travel the world one day, helping and volunteering. In 2007, Brian received the "best promotion" he'd ever received when he got fired from his warehouse job. This resulted in him pursuing music full time. They never "settled down" or lived in any one place like a stereotypical band where one builds up a fan base locally or regionally. They took to the road and began spreading the music and their message around the world. Over the last decade, they have spent nearly a year in Africa, which inspired Katie to register their charity, Journey4YOUth as a 501c3 non-profit organization. As their fan base has grew, so has their outreach. Every year, Journey4YOUth has been able to provide over 100 education sponsorships for students. They provide rain water harvesting tanks, and education for women and elders in the village they lived in, Kaswanga Village, Kenya. Since 2010, their fan base has donated over $160,000 to these initiatives as well as other causes. They volunteered twice during the refugee crisis, (Moria Refugee Camp in Greece and with an NGO serving displaced Syrians in Turkey). They also went to Standing Rock in 2016. They acknowledge that their work can be painful sometimes, but pain can burn as the fuel to fire an urgency to focus on worthy causes that are bigger than oneself. As one would expect, many of these experiences have influenced Brian’s music. Brian is a live looping multi-instrumentalist. 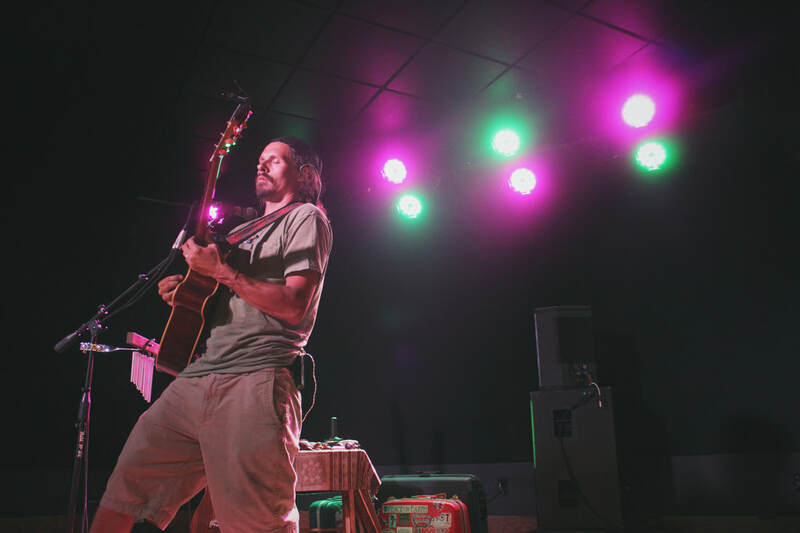 He uses open tuned and lap guitars with didgeridoo's, beat-boxing and many other small percussion instruments to create upbeat acoustic, soul roots music - with passion and purpose. His music is unique, literally building songs organically, using everything from didgeridoos to a thick metal chain to create intricate soundscapes combined with blue eyed soul. In 11 years, the music has taken them around the world. They have toured through 49 states and 35 countries (throughout Africa, SE Asia, USA, Central America, Europe, Australia and New Zealand). While staying completely independent they have sold over 20,000 cd's and have over a half million views on Youtube. Yet the purpose behind the music is what drives them. Brian and Katie have witnessed hundreds of thousands of people from all over the world come together in the name of music and humanity. Then as a direct result, thousands of kids are getting educated and empowered. The music is transforming people, making positive change and empowering the future generations. ​This is more than music. It's a movement.